One of the most beautiful mosaics in St. Peter's, this altarpiece is a reproduction of Raphael's 'deathbed' painting, now in the Vatican Museum. Giulio de' Medici commissioned the painting for the the French Cathedral of Narbonne, but it remained in Rome in San Pietro in Montorio after 1523. Napoleon had it taken to Paris in 1797, and it was brought back to the Vatican in 1815. A team of six artists took nine years to execute the mosaic, finishing in 1767. Returning to the aisle, against the pier supporting the dome is the Altar of the Transfiguration, with a mosaic reproduction of one of the masterpieces of Raphael (1483-1520), the great painter's last work. Jesus, bathed in light, is borne aloft between Moses and Elijah, also in ecstasy, while the Apostles Peter, James and John, prostrate, contemplate this glimpse of paradise. On the left, almost hidden, are Sts. Felicissimus and Agapitus, who are commemorated on 6 August, the Feast of the Transfiguration. In the lower part, the healing of the young man who was "possessed" is portrayed, giving the scene a sense of agitation, while in the upper part of the picture, profound peace is contemplated. In the center, a kneeling woman represents the Church which brings peace and hope and invites us to await them as gifts from above. 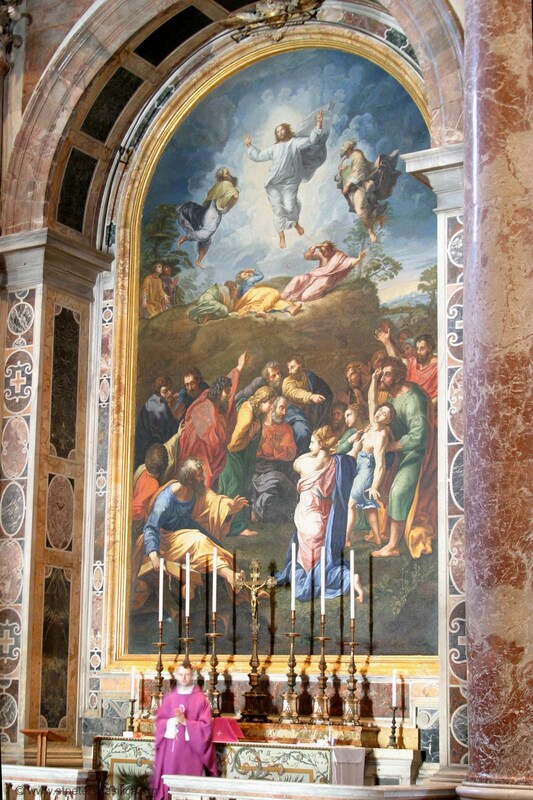 At the end of the left aisle, on the outside of the St. Andrew pier, there is a mosaic copy of Raphael's "Transfiguration," executed under the supervision of the expert Monosilio from a copy by A. Masucci (an earlier one by S. Pozzi was refused) now in the Loggia of the Benediction. The painting, left incomplete by Raphael, and finished by G. Romano and F. Penni, was commissioned in 1517 by Cardinal Giulio de' Medici, the future Clement VII, for the Narbonne Cathedral, where he was bishop. There is, in fact, a certain imbalance between the sublimely conceived and intensely painted upper part, and the lower part in which the expressiveness of the characters is carefully rendered, but exterior aspects of Mannerism also surface in the excessively emphatic attitudes and postures. 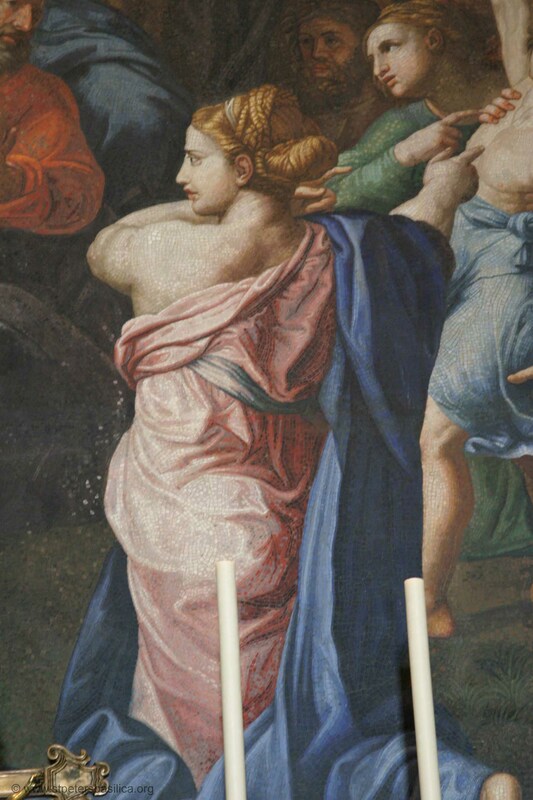 This work was considered as Raphael's testament, since it was placed at the head of his death bed "breaking the heart of all who look upon it," as Vasari wrote. In this chapel it is possible to admire a mosaic reproduction of one of the world's most famous paintings "The Transfiguration" showing Christ on Mount Tabor, Raphael's last painting (1483-1520). It shows the Lord in a nimbus of bright light, raised in the air with the prophet Elias and Moses, the lawgiver, while the three favored apostles, Peter, James and John gaze on this heavenly scene from earth, wishing that it would last for eternity. The upper portion of the picture reveals the tranquil ecstasy, the celestial serenity and peace the Lord grants only to those who are with Him and who want to be with Him. The lower part contrasts strongly with the upper. The figures are agitated; they look at the possessed boy whose father is holding him. All are troubled, and they seem to be seeking a human solution to ills of the spirit. Only an apostle, indicating the Lord on the Mount reminds them, the disheartened and discouraged, of the source of salvation. In the middle, the kneeling woman symbolizes the Church and its task of bringing peace, hope and faith to the victims of evil. Raphael died young, he was only 37. In his final delirium he asked to see his painting for the last time. His friends brought it to him, and placed it on the bed in which he died on Good Friday, 1520. 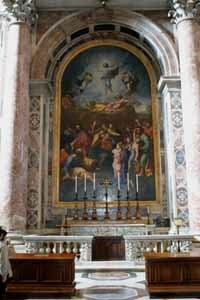 The same painting was carried at the head of the funeral procession to the Pantheon where the great artist is buried and awaits his own transfiguration. 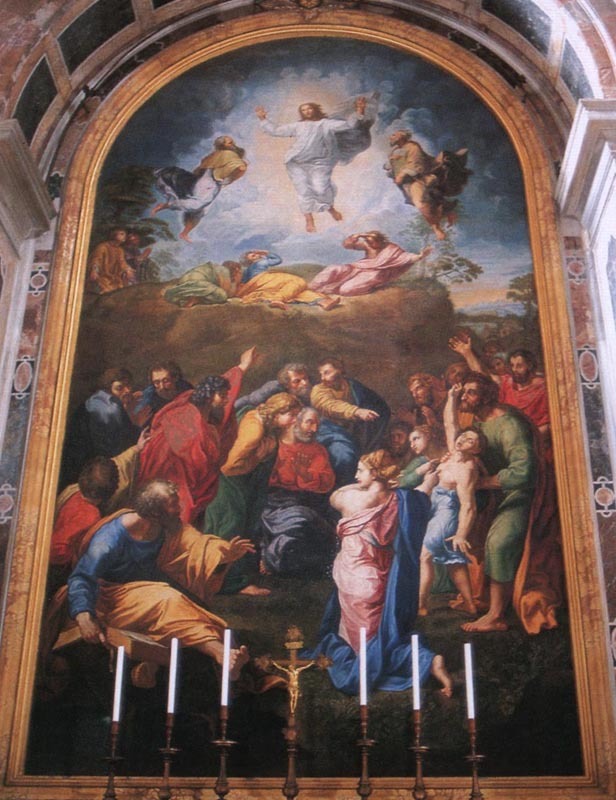 The idea for a mosaic copy after Raphael's Transfiguration goes back to 1744, when the Congregazione della Reverenda Fabbrica asked permission to copy the painting, then in the church of S. Pietro in Montorio. It was not executed in mosaic until several years later, from 1759 to 1767, by Giovanni Francesco Fiani, Guglielmo Paleat, Alessandro Cocchi, Bernardino Regoli, Pietro Polverelli, and Vincenzo Castellini. The cartoon had been painted by Stefano Pozzi, who received payments from the Fabbrica from 21 December 1756 to 15 August 1759. The final recognition and acceptance of the mosaic was made in June 1768 by Salvatore Monosilo, who noted that it had only recently been placed in the basilica. The altar on which it was set had originally contained Death of Sapphira by Christofano Roncalli, first as a painting, and then as a mosaic. The painting by Raphael is presently in the Vatican Picture Gallery. Pozzi's copy was exhibited at the Museo Petriano in the 1920's. 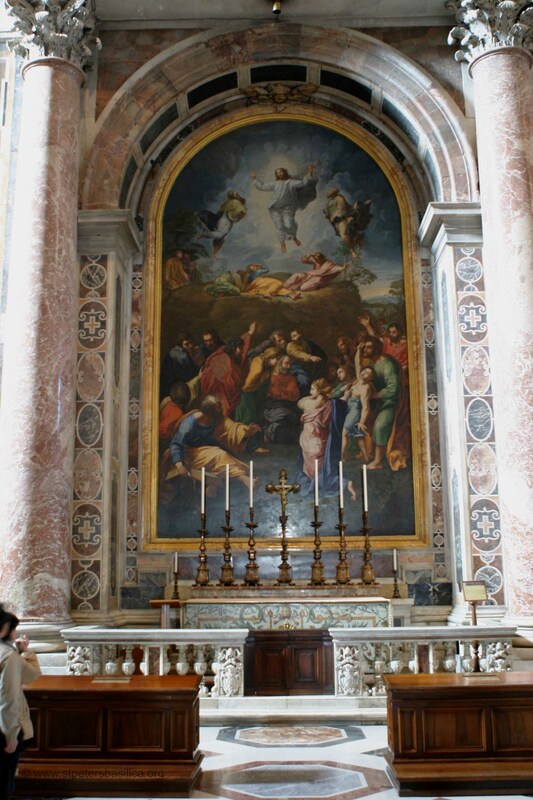 At the end of the left aisle is the mosaic copy of Raphael's Transfiguration, kept until 1798 in San Pietro in Montorio, whence it was removed by Napoleon; recovered in 1815 by Canova, it was subsequently put on view in the Vatican Museum. Cardinal Giulio de' Medici commissioned the Transfiguration in 1517 to Raphael for the French Cathedral of Narbonne. Bad health prevented Raphael from finishing it. 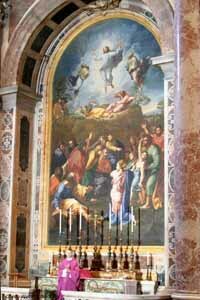 The painting, however, remained in Rome in San Pietro in Montorio after 1523. Taken to Paris 1797, it was brought back in its present location in 1815. 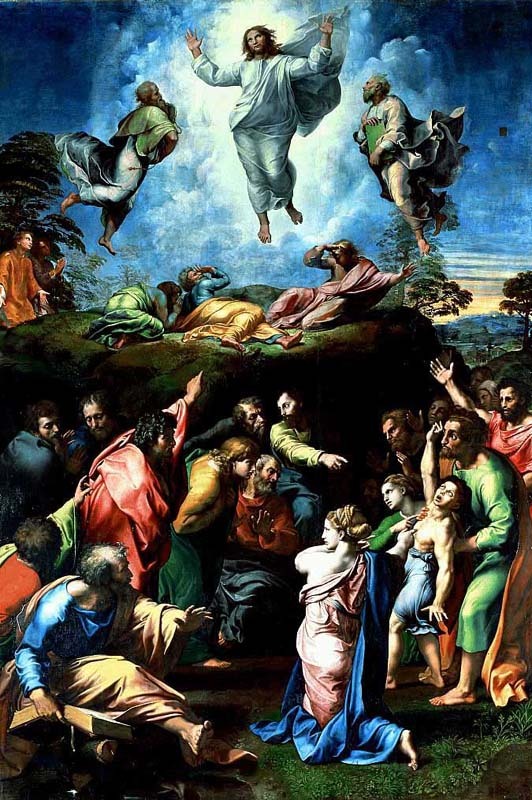 The composition of the Transfiguration is divided into two distinct parts: the Miracle of the Possessed Boy on a lower level; and the Transfiguration of Christ on Mount Tabor, in the background. The transfigured Christ floats in an aura of light and clouds above the hill, accompanied by Moses and Elijah. Below, on the ground, are his disciples. Some are dazzled by the light of glory, others are in prayer. The gestures of the crowd beholding at the miracle link the two parts together: the raised hands of the crowd converge toward the figure of Christ. In this very grand composition Raphael has summed up all the elements present in the best of contemporary painting, including references to classical antiquity, Leonardo da Vinci (without doubt based on his recall of impressions garnered during his stay in Florence) and - not without a certain narcissism - himself. The works set the stage (just as surely as Michelangelo's Doni Tondo) for Mannerism.